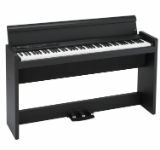 Korg is known for making quality and very affordable digital pianos. The Korg B1 and the Korg SP280 are prime examples that Korg can make a digital piano that beginners and those that are a bit more experienced can enjoy. 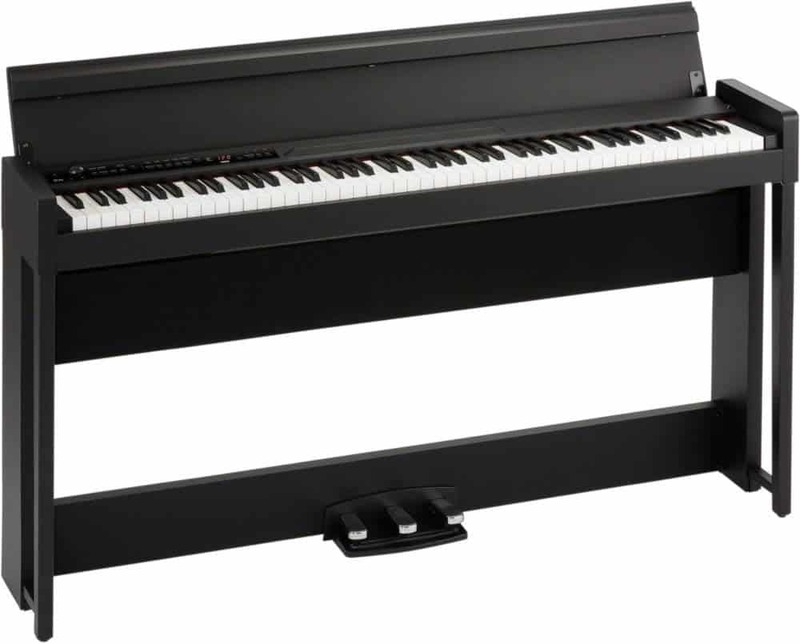 Now enters the Korg C1 Air, a digital piano that comes inside an elegant cabinet. 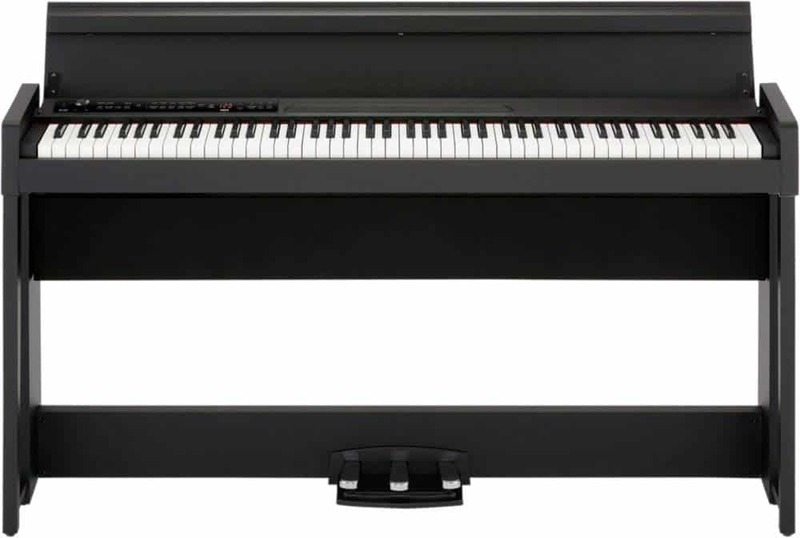 Weighing about 77 lbs (with the stand included), but only taking up about 10” worth of space in depth, the Korg C1 Air is a piano that can be placed virtually anywhere in your home without too much hassle. But, is this digital piano really worth your time and money? 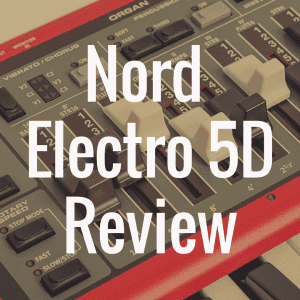 Well, in this Korg C1 Air review, I’m going to dive deep into what this piano has to offer potential customers, and especially help you figure out if the Korg C1 Air or Korg G1 Air is ultimately the better purchase. To better help you, please take a moment to use our interactive table below, so you can directly compare the Korg C1 Air to other notable digital pianos on the market. Now, the Korg C1 Air features the word “Air” because it’s a bluetooth capable digital piano. We’ll definitely talk about that feature a little later in the review, because it’s important. But first, let’s discuss the design of this piano, and some key important features you need to be aware of. The Korg C1 Air costs roughly about $1,400 or $1,500, depending on where you’re shopping. It comes in three finishes—black, white, or rosewood (brown). This is a little more of a higher end digital piano compared to entry level keyboards, so you’re absolutely going to get 88 keys to play with here. The Korg C1 Air also features an RH3 keyboard. This keyboard does a good job at simulating the experience of playing on a grand piano. 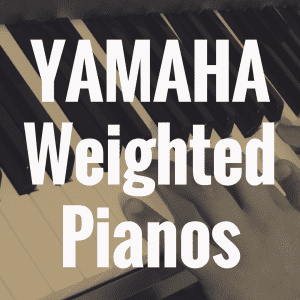 The notes are responsive, and as a pianist, you can take comfort in knowing that this piano features weighted and graded keys. On top of that, in regards to key touch control, you have the option of five sensitivity levels (which are light, normal, heavy, stable and fixed). Below, please take a moment to view some of the best-selling digital pianos on Amazon, and then see how well they compare to the C1 Air by Korg. Now the Korg C1 Air does come with 30 voices built into the piano. Here, you get a German Piano Sound and Japanese Piano Sound. The German piano sounds very warm and rich to the ears, while the Japanese sound is considerably more bright. If you’re a fan of pop music, the Japanese piano is going to be a sound you’ll want to play around with a lot quite a bit. It wouldn’t be a digital piano without a bevy of other really cool sounds to play with too, and in this case, the C1 Air has you covered. Additional voices are the electric piano (where you can of course enjoy playing the Fender Rhodes), the harpsichord (get ready for a bright, brash sound), clav, organs (church organ, jazz organ, and the Santana organ are notable here), guitar (nylon guitar), strings, choir, bass and much more. You also get three high quality effects to play around with too—namely brilliance, reverb, and chorus. 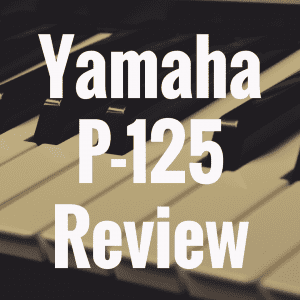 These settings are especially great because, with something like brilliance, you can make the sound mellow or soft, and ultimately can bring it up to a much more brighter sound depending on how hard you go about hitting the key. It’s easy to mess around with the effects on the Korg C1 Air, since they are preset for each of the built in voices. So really, all you need to do is press the correct button for the sound you want, and you’ll easily be able to enjoy the settings you most want to help you creatively manipulate the sound to your liking. And in terms of items that come with the piano, you get an AC adapter, a power cord, and a stand with a three pedal unit. The Korg C1 Air does not come with a bench, so if you’re in need of that, that’s going to be an accessory you’ll have to purchase separately. In case you are looking for an adjustable bench, you might want to take a look at the Korg PC 550 or the Korg PC 770. With the Korg C1 Air, it’s nice to see that you can do familiar things such as split the keyboard. So here, you can split the keyboard into two sections, and have your left hand play one particular voice, and your right hand play another. This makes it very easy to get, for example, the sound of an electric piano and an organ playing at the exact same time. With just the click of a couple buttons, you can be playing an electric piano in your left hand, and a jazz organ with your right hand. Of course, you aren’t limited to just the electric piano and jazz organ when you plot the keyboard. You’re able to add any sound you want—electric bass, symbols, electric piano, etc. You also get a 2 track recorder on the Korg C1 Air, as well. If you’re playing solo (i.e, without a teacher nearby), then the recording feature is a great way to check in and grade how well you’re doing. And that’s because the 2 track recorded will allow you to record your practice session and you can play it back to listen to how you played the musical piece. 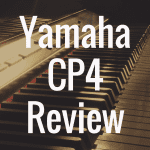 Did you hit all the right notes, or is there significant room for improvement? You can find this out easily by using the very handing 2-track recorder option. These days, it’s important to be able to connect a digital piano wirelessly to a personal device for more interactive functionality, and that’s exactly what you can do with the Korg C1 Air—thanks to Bluetooth technology. With the Korg C1 Air, you can connect your smartphone or your tablet to the C1 Air via Bluetooth, and this allows you the ability to stream your music through the C1 Air’s speaker system. So, if you wanted to play along with your favorite song that’s located on Apple Music or Tidal or Spotify, you’ll be able to stream the song from your device through the C1 Air’s speakers and play right alongside it. And honestly, the best part of this feature might actually be when you’re not at the piano. Because now, no longer do you need to invest in a robust or expensive hi-fi audio system to enjoy your music. Instead, simply stream your favorite tunes via bluetooth, and you’ll be able to enjoy wonderful sound as your Korg C1 Air fills in quite nicely in place of bookshelf or tower speakers. Speaking of the sound, I think it’s also important to point out that the Korg C1 Air comes with a stereo sound optimizer, which gives additional presence to the music you’re listening through on your headphones. In short, this optimizer has the ability to make it feel as if you’re playing on an acoustic piano. So if you’re worried that using headphones while you practice will dull the sound, or simply make it feel more canned, the stereo sound optimizer can fix those concerns. Korg C1 Air vs Korg G1 Air: Which to Buy? 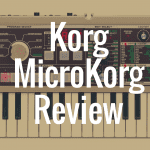 So at this point, you might like a lot of what the Korg C1 Air has to offer, but you also may just be as equally interested in knowing how it stacks up against the Korg G1 Air. Well, let’s take a look at some of the key differences so you can determine this instrument is for you. First, it’s important to note that the Korg G1 Air has over 32 sounds onboard. Notable are the inclusion of the German, Austrian and Japanese concert grand piano sounds. The Korg C1 Air, by contrast, only has 30 onboard voices. And in terms of concert grand piano sounds, it sports the German and Japanese piano, but doesn’t feature the Austrian grand like the G1 Air does. It’s also worth mentioning that the Korg G1 Air has USB connectivity, while the C1 Air doesn’t. Where you’ll likely notice the biggest difference between the two resides in the sound department, however. At the end of the day, the G1 Air is simply a stronger instrument in this category. And that’s because the G1 Air features a combined 80 watts of power over 4 speakers. The C1 Air, by contrast, features 50 watts of power via a 2 speaker system. And lastly, the G1 Air costs about $200 more than the C1 Air. At the end of the day, the Korg C1 Air is great digital piano that features a good amount of voices to play around with (including some very nice grand piano sounds), a good key action, and is a beautiful looking digital piano that does its best to give you the feel of an acoustic piano at a very affordable price. Although it does come with bluetooth technology, there doesn’t yet seem to be an app that’s akin to Yamaha’s Smart Pianist App that allows you to pair the digital piano to your smart device and control the instrument’s multitude of functions, as well as record and save the music you create. Hopefully, something like that is coming, as it would be a great way to incorporate the use of bluetooth technology while also being incredibly helpful to the pianist. 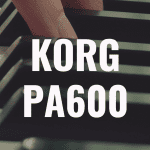 Korg Pa600 review: Just as Good as Pa700 and Pa1000?